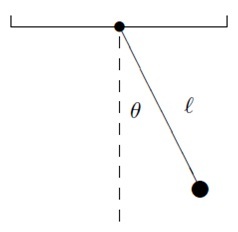 Consider the motion of an perfect pendulum that consists of a mass m attached to an arm of length l.
where θ is the angle of displacement. mθ¨+ γθ? +mg/lsin θ = A sint. Here γ is the coefficient of friction moreover A and are the amplitude as well as frequency of the forcing. where c = γ/m. ω = g/l and a = A/m. θ(0) = θ0 and θ? (0) = v0. The entire of the standard methods for solving ordinary differential equations are intended for first order equations. Therefore it is inconvenient to resolve higher order equations numerically. Nevertheless mainly higher-order differential equations that take place in applications can be converted to a system of first order equations and that is what is usually done in practice. y?n = x(n) = f(t, y1, y2, . . . , yn). In vector form this is simply y?= f (t, y) with fi(t, y) = yi+1 for i < n and fn(t, y) = f(t, y1, y2, . . . , yn). y?2 = −cy2 − ω sin(y1) + a sin(t). As stated above the major reason we wish to change a higher order equation into a system of equations is that this form is convenient for solving the equation numerically. Most universal software for solving ODEs (including Mat lab) require that the ODE be input in the form of a first-order system. Additionally there is a conceptual reason to make the change. In a system illustrate by a higher order equation knowing the position isn’t enough to know what the system is doing. In the case of a subsequent order equation such as the pendulum one must know both the angle and the angular velocity to know what the pendulum is really doing. We call the pair (θ, θ?) the state of the system. In general in applications the vector y is the state of the system described by the differential equation. In Mat lab there are several commands that are able to be used to solve an initial value problem fora system of differential equations. All of these correspond to different solving methods. Thestandard one to utilize is ode45 which uses the algorithm ‘Runge-Kutta 4 5’. We will study aboutthis algorithm later.